Over the past several years I’ve been stuck designing new embedded applications using a single MCU vendor, previously I did a lot of work with Microchip and other products and I was very active at the Microchip forum. 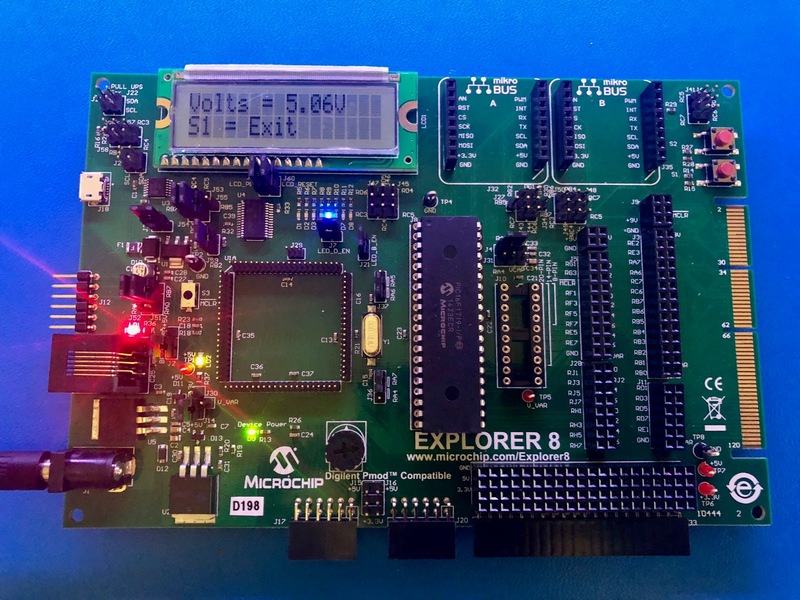 Now that my situation changed have the opportunity to go back and catch up and start developing again with Microchip products, then to get up to speed I’ve got one of the new Explorer 8 Development Board. The Explorer 8 has more or less the same form factor as previous boards like the PICDEM 2 Plus Demo board, including a monochrome 2x16 character LCD and as before various sizes of IC sockets to accommodate 4, 8, 14, 20, 28 and 40 PDIP parts but now with the addition of the Microchip 80-Pin PIM headers. At first it may look confusing but this new board has many more connectivity options, now including two 2x8 Digilent PMOD connectors, and a pair of MikroElektronika mikroBUS headers, plus a pcb edge connector for an expansion boards, two female headers for Microchip PICtail boards, and various headers here and there to access some key signals like I2C, GPIOs, power supplies, etc. 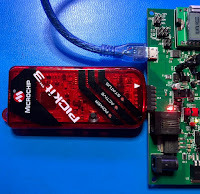 In addition, the board has a microUSB connector tied to a MCP2221 acting as a USB to UART/I2C bridge. The microUSB connector can also be used as a source for 5V power. My board arrived with an 8-bit PIC16F1719-I/P MCU installed on the 40-pin IC socket and pre-programmed with the Microchip demo. Pay attention when you power up the board for the first time, out of the box at least for the one I received the J2 jumper was in the position to get power from the microUSB connector. Since I was using the barrel jack with power coming form a 9V power supply I had to move that connector to the right position. 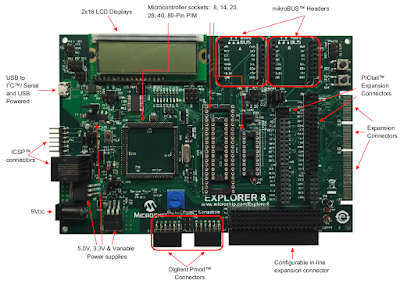 You will find various jumpers to configure some features depending on the application/MCU, clocks, power, etc, which makes the board together with the connectivity options more versatile than previous development boards. The usage of the jumpers is well described on the User’s Guide. Always double check that you have the jumpers in the correct position for your application. The Demo code is the classic Microchip voltmeter using the ADC to read the voltage from a pot, flashing some LEDs, but now instead of having the RS-232 interface, using the MCP2221 USB-UART bridge and a terminal emulator like TeraTerm you can get a message via the serial interface. Another interesting addition to the board is that now not only you have the classic RJ11 jack ICSP connector for programming/debugging with ICD3 or other tools, the board has a right angle 6-pin ICSP header that can be used with for example a PICKit 3. This is great many times I’ve been stuck trying to find in my tool chest the magic adapter. I did play a little bit with the pre-programmed demo, nothing super exciting about it but it is a good enough demo to get started, only issue is that I’m still trying to find the source code for it. I ordered few samples for the new K40 parts, when they arrive I’ll give it another try and post and article on my Project Blog showing how to do it. While 8-bit MCUs may “feel” outdated they are still quite good and cheap for many applications, so I’ll explore some ideas in the near future and share them here.